I haven’t read any good sci-fi in a while, so I was looking forward to reading Six Wakes. I’ve enjoyed Mur Lafferty’s other works (The Shambling Guides series), and I’ve even interviewed her on this blog. 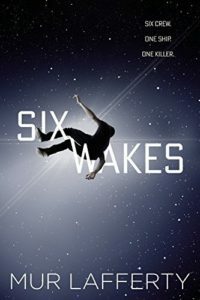 Six Wakes is about a crew of a generation ship who wake up in clone bodies to a scene of carnage – their previous bodies are all dead or dying, and the last twenty five years of their memories are missing. As they try to reconstruct what happened and figure out who among them is a murderer, we learn more about their past lives and the politics of cloning. The real star of this book is the concept of cloning. The author really delves into what our world would evolve into in a few hundred years if cloning and mindmapping was commonplace. I don’t agree with some of the predictions, but they’re consistent and fit the story well. First, we see what “normal” clones are like, and then we are slowly exposed to some of the bizarre (but completely understandable) ways that the technologies could be used. The characters are good, but they’re a little flat, and I didn’t feel like I was able to connect with them. This could be because of expectations – the author’s Shambling Guides books are urban fantasy, and it’s a staple of the genre to show exactly what the protagonists are feeling and thinking. This is a very different kind of books, everyone on board has secrets they are hiding from each other and from the reader, so they’re pretty tightly buttoned up. I felt like that made the reveals a little awkward, because every member of the crew is also a point of view character at some point, but even though we know their immediate feelings, they never think about their secrets until after they are revealed. I understand that that kept the tension in the story, but I couldn’t help feeling like some of the revelations seemed to come from nowhere. Sometimes I felt like the book had too much human drama, but the conclusion of the story is satisfying – the technology is cool throughout, but in the end, everything comes down to human decisions. This entry was posted in Books, Reviews and tagged fiction, science fiction by Kriti Godey. Bookmark the permalink.